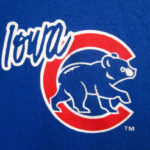 The Iowa Cubs open the home season this evening against New Orleans after a successful road trip to Nashville. The Cubs (4-1) rallied for three runs with two outs in the seventh inning to snag a 6-5 victory over the Sounds (1-4), Monday at First Tennessee Park. Iowa is 4-1 to start the season for the first time since 2006. Iowa struck first for just the second time in five games, scoring two with the help of an error in the second. The I-Cubs worked a 3-1 edge after four, but the Sounds fought back. With the aid of an error on the Iowa side, Nashville plated two in the fifth to lock the game 3-3. Ian Happ cashed in with a two-out RBI single in the seventh to put Iowa back in front. Phillip Evans then crushed a two-RBI double, with Happ scoring from first, to cushion the I-Cubs’ lead and add necessary insurance. Carl Edwards Jr. made his first appearance of the season with the I-Cubs and got Matt Carasiti out of a two-out, bases loaded situation with a strikeout. Edwards Jr. spun a scoreless 1.1 innings with three strikeouts on his way to the win. Tim Collins pitched a perfect frame, before Rowan Wick let Nashville get back in the game with a run in both the eighth and ninth innings. Brian Duensing got the final two outs of the game to earn the save.